Kids’ Club Summer School Sign-Ups are now OPEN! If your child will be attending summer school and needs Kids’ Club services before or after school, sign up below. Note–There are two different sign-ups. Please sign up under the school that your child currently attends or will attend during the 19-20 school year. 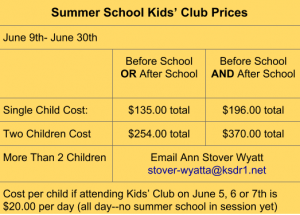 For Summer School Kids’ Club and Summer Expeditions, there is a $25.00 enrollment fee per student. However, if your student is participating in both, you only pay ONE $25.00 fee. Summer Expeditions program runs from July 1-August 6. The program will be held at Kearney Elementary from 6:30 AM-6:00 PM. Cost is $800.00 per student. Space is limited. If the program fills up, you can be added to the wait list and will be notified if space becomes available. We have a waiting list at a couple of our locations…contact Ann (number below) if you are interested in enrolling your child/adding them to our waiting list! Kids’ Club is a program for students in kindergarten through 5th grade. 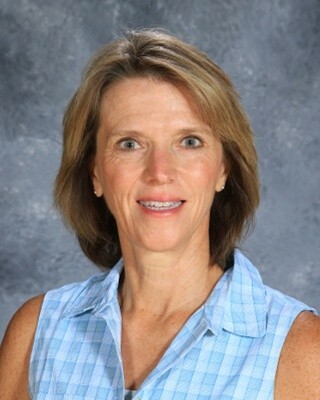 It is provided for patrons of the Kearney R-1 School District whose jobs require them to be away from home during the before and after school hours. The program is open on days that school is in session, and additionally on parent-teacher conference day and teacher professional development days (we consolidate to 2 sites on these full days, and there is an additional charge). Also, we are open during the district’s summer school program (typically, the month of June) and for our July – early August program, “Summer Expeditions”; the summer programs require separate enrollment forms which will be available in spring each year. Kids’ Club provides a variety of fun and educational activities for our children, including arts and crafts, dramatic play, music, gym time and computer games, to name just a few. A qualified staff is present at each Kids’ Club site. The cost of the program varies based on services needed and is based on 174 student/school days (see “Tuition Schedule”). The summer programs’ tuition will be explained prior to the enrollment each summer. We begin fall enrollments each May 1st; updated enrollment forms will be available on-line to download at that time. The first 2 weeks of May are for those currently in the program to re-claim their spots, and new students will be enrolled during the latter half of the month. **Enrollment is limited, so you may be placed on a waiting list until space is available. ** The completed application can be turned in at any Kids’ Club location (Dogwood Elementary, Southview Elementary, Hawthorne Elementary and Kearney Elementary), taken to the Board of Education office, or e-mailed to Ann Stover-Wyatt (see e-mail address). E-mailing is the fastest way to turn in the completed form. 6:00 a.m. – 8:30 a.m.